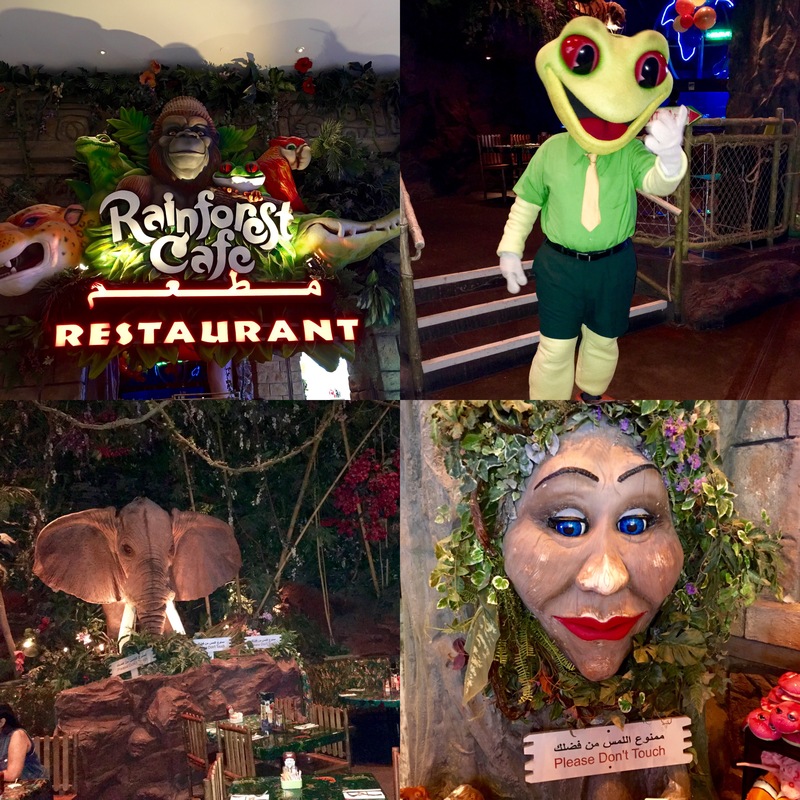 If you live in Dubai or you are a tourist and you want to visit a restaurant that is a wholesome family entertainer, then look no further than Rainforest Cafe in Dubai Mall. The Rainforest Cafe is the ultimate destination for kids birthday parties and other special events. Adventure is the specialty of Rainforest Cafe. The Rainforest Cafe recreates a tropical rainforest with waterfalls, lush vegetation, rainstorms with thunder and lightning effect and indigenous creatures. It has it’s own mini aquarium. The Rainforest Cafe is perfectly located, very close to the aquarium. It is a forest themed cafe- dining here is like going on a jungle safari. The ambience is amazing, I literally felt like I was dining in a Jungle surrounded by lush green forest and wild animals. Rainforest Cafe also offers a Retail Village in the beginning of the cafe. The Retail Village provides an unique shopping experience to the entire family. It offers a wild variety of toys, clothing and souvenirs. The staff and the service is friendly and helpful. A special thanks to Marco, who took good care of us. 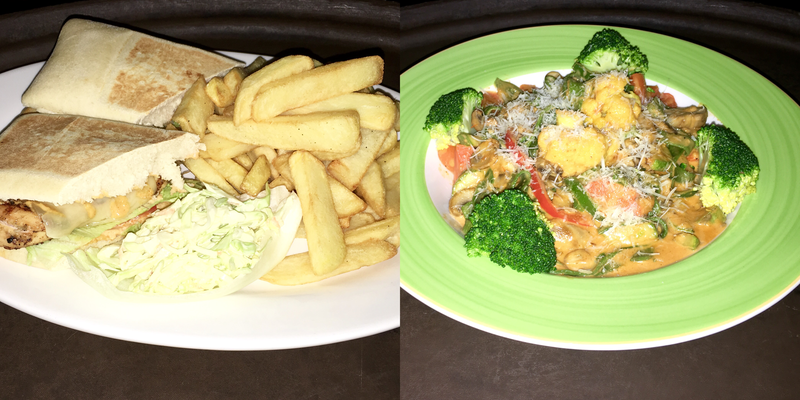 Recently, the Rainforest Cafe changed their menu- they have retained few dishes from the old menu and added some new dishes. We started off our tasting session with a round of their signature drinks that comes in a souvenir glass. (the glass comes with lights) You can take home the glass. My friend had a drink named Mango Monkey and I had a drink named Cheetah Rita. I know, such amusing names. My friend and I were grinning at each other, when we ordered the drinks. Mango Monkey- It had a frosty blend of mango. It tasted delicious. A definite must-try for all mango lovers. Cheetah Rita- It is their premium margarita and comes in three fruity flavors- Strawberry, Mango and Pomegranate. I had the Pomegranate flavor, it was a refreshing drink. Their beverage menu consists of wide variety of mocktails, smoothies, freezes, shakes, fresh juices, iced tea, coffee and soft drinks. 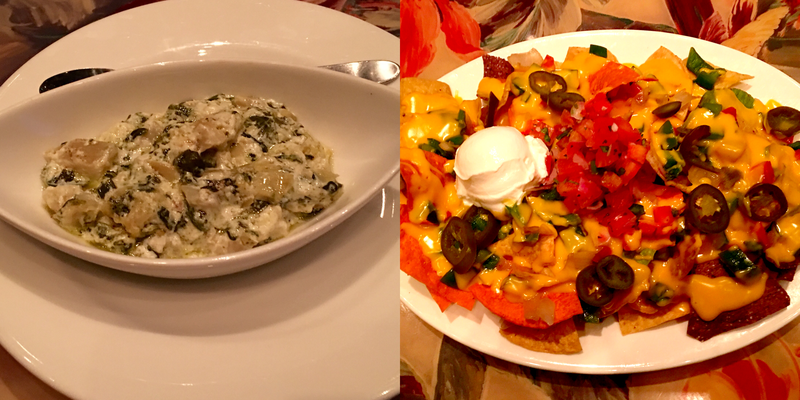 We ordered Spinach & Artichoke Dip With Tri-Color Tortilla Chips and Lava Nachos as our appetizer. Spinach & Artichoke Dip- We loved this tasty dip. It was creamy and rich and made a perfect dip to dunk those crispy tri-colored tortilla chips. Lava Nachos- Let me warn you that Lava Nachos is very addictive. You will not stop till you polished the whole plate off. Lava Nachos is basically three types of tortilla chips topped with melted cheddar cheese and seasoned with ground beef(for us they didn’t put the ground beef as we asked them not to) peppers,onions and black beans and served with sour cream, green onions and pico de gallo. A definite must-try. As for the mains, my friend ordered a Blue Mountain Chicken Sandwich and I ordered a Spinach Fettuccine. Blue Mountain Chicken Sandwich- All their sandwiches and burgers come with a portion of salad and fries. My friend liked the sandwich, she said that the chicken was tender and well done. Spinach Fettuccine- This is the regular pasta that we find everywhere. It is a simple dish and hence you can’t get it wrong. It had veggies tossed in alfredo and marinara sauce and topped generously with grated Parmesan cheese. 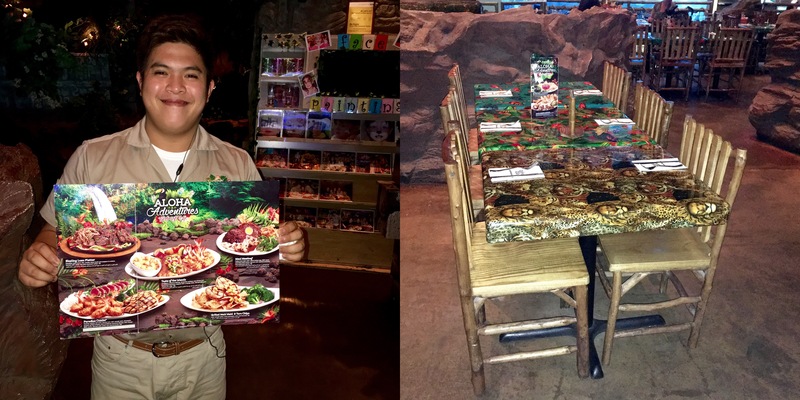 Rainforest Cafe’s food menu offers a wide range of variety. The portion size is huge. Whether you are a non vegetarian or a vegetarian, you will have plenty of options. 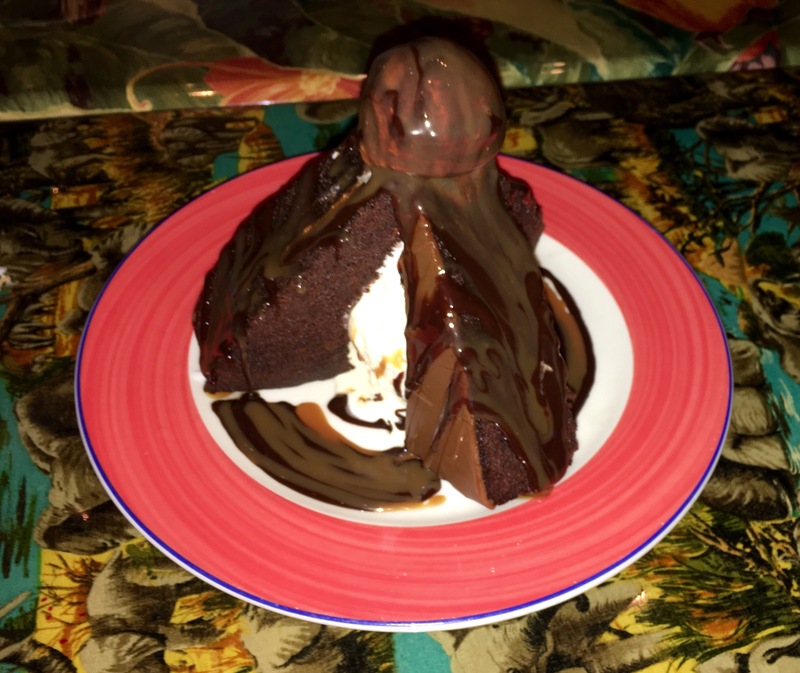 How can we end a meal without having their famous dessert Sparkling Volcano. Sparkling Volcano- The portion size is huge and can easily be shared among 3-4 people. Three huge slices of rich homemade chocolate brownie cake is stacked up high and served warm with creamy vanilla ice cream, fresh whipped cream and topped with caramel and chocolate sauce. Make sure to keep some space for this divine dessert. It is worth the calories. Rainforest Cafe is a great family restaurant. The place is fun, especially for the kids. 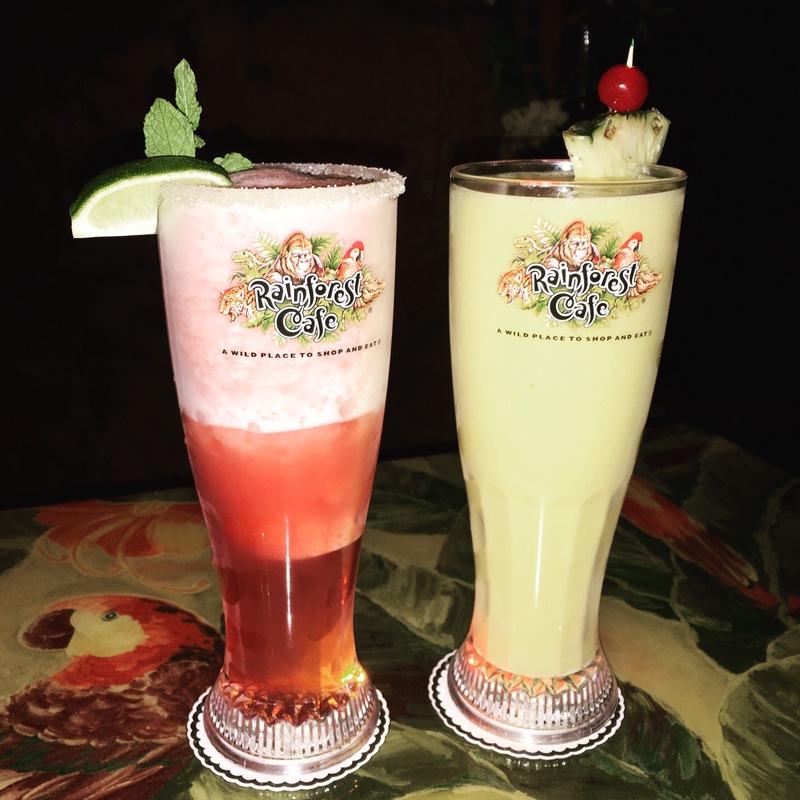 If you are looking for an adventurous dining spot for the entire family then, you should definitely consider Rainforest Cafe. Their birthday party packages are amazing. Can’t wait to visit them again with my kids.